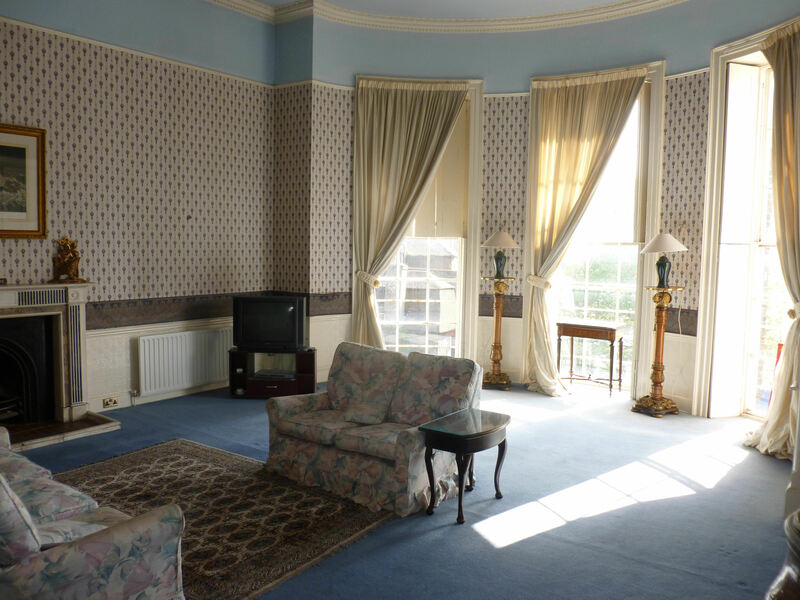 Castle Hill House is a Grade II* Listed building that overlooks Dover from the East side. Many famous people have stayed there from British Prime Ministers to American Presidents. However, Dover District Council Planning Committee without a site meeting and against the advice of the Chairman of the Committee and DDC Officers have given, what is effective retrospective planning permission, to an industrial car wash that has already done substantial damage to the building. Unfortunately, Dover’s elected representatives and those who are vying to have the building demolished to build flats want to bring it about by destroying it’s fabric. Phineas Stringer senior bought the land on which Castle Hill House stands, at the bottom of Castle Hill and overlooking Maison Dieu Road. He owned some 375 acres of land at Elms Vale extending to Aycliffe and Capel and including two manors. On his newly acquired land, Castle Hill House was started but he had died, in 1757, before it was completed in 1760. The mansion was set in fine parkland that extended along present day Maison Dieu Road towards Charlton in the north and up Castle Hill to the east. Between what are now Eastbrook Place and Ashentree Lane were the stables and gardener’s cottage. In front of the House was a large shrubbery. The land on which Victoria Park was built was then part of the estate and later became known as Stringer’s field. 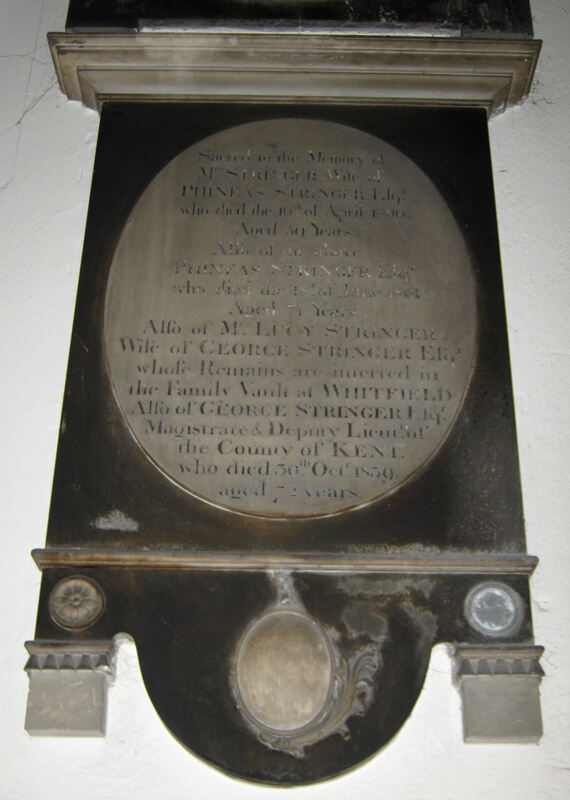 Stringer Family Memorial, St Mary’s Church. Phineas Stringer junior, born 1730, inherited the estates in 1782 and was elected Mayor. He had married Affra Rouse (1740-1800), daughter of Richard Rouse a wine merchant and Mayor in 1748. Through the marriage Phineas inherited Archers Court, Whitfield. In 1785 he put on the market the Shoulder of Mutton Field, situated below the Castle, under which there were ‘two complete sets of wine-vaults.’ Phineas, listed as a wine merchant, owned one and the banker, Peter Fector, owned the other. In March 1786, Thomas Jefferson (1743-1826) following a visit to France, returned by way of Dover staying for two days. It is known that he enjoyed the Kent countryside and visited Dover Castle. There is reason to believe that during this time Jefferson stayed at Castle Hill House. On the night of April 27th 1786 he returned to Dover with plans to take a ship back to France during the day. However, due to bad weather and the state of the roads he missed his ship, arriving in Dover around midnight. Because of the weather he could not set sail for France for 36 hours, so again, it is believed he stayed at Castle Hill House. Jefferson was an American Founding Father and the principle author of the Declaration of Independence. He was America’s third president (1801-1809). Affra Stringer died in 1800 and Phineas junior a year later. There is a fine memorial to both of them in St Mary’s Church. Their son George had a house in Dolphin Place but following the death of his parents deaths he moved into Castle Hill House. In the grounds he built a huge barn that was a landmark for nearly a hundred years! Their daughter married Edward Broadrip and succeeded to the Elms Vale estate. George married Lucy Walker and was Mayor of Dover in May 1802, when a Peace Proclamation with France was declared during the Napoleonic Wars (1793-1815). To commemorate this event, George and Lucy had a grand illuminated transparency hung on the front of Castle Hill exhibiting the figure of Peace. They also held a magnificent ball that was talked about for years after. George died in 1839 but long before then he had sold Castle Hill House to John Jeken. John Jeken was Mayor of Dover in 1822 and Master of the town’s almshouses. On 16 January 1823, as Mayor and therefore Coroner, John held the inquest into the death of William Cullen of the Badger Revenue Cutter and three unnamed seamen who were members of the crew of the Three Brothers cutter. The verdict, in the case of Cullen, was wilful murder and for the three seamen, justifiable homicide. The Three Brothers was a known smuggling vessel. The estate was put on the market in 1829. The house was described as having ten bedrooms, housekeeper and servants’ quarters, stables for four horses, a knife house, poultry house, granary, washhouse and numerous other facilities. The grounds were put up for sale separate from the house and in two lots. One was the eastern part of the estate and included Stringers Field. The second was the northern part stretching towards Charlton. John Jeken moved to nearby Hammond Place and died on 30 March 1863 aged 75. The whole estate was bought by auctioneer, Councillor Charles Lamb (1779-1869), who put it to auction in 1832 where it went for £7,000 to Edward Knocker (1804-1884), solicitor, later Town Clerk and Mayor. Along with three other businessmen, Edward Knocker laid out Castle Street, the eastern part of which is on land that had formally been part of the estate. 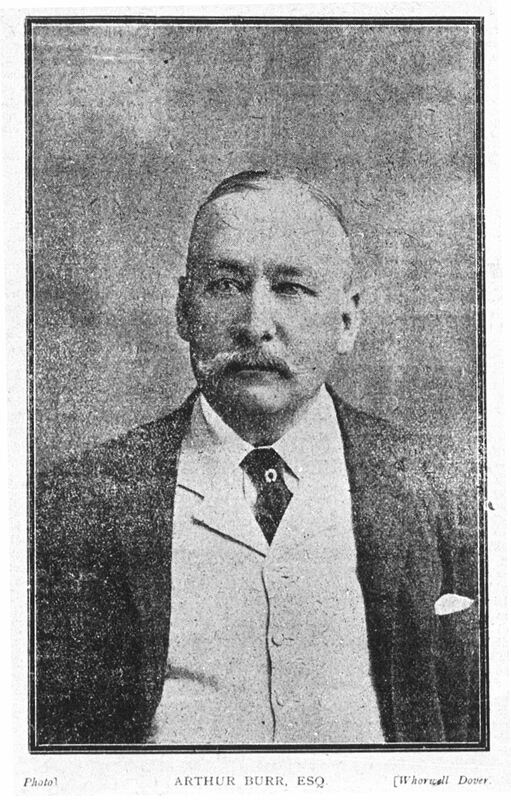 Edward Knocker married three times and by his second wife had several children two of which, Edward Wollaston Knocker (1838-1907), known as Wollaston, and Vernon Knocker (1849-1933), became solicitors. 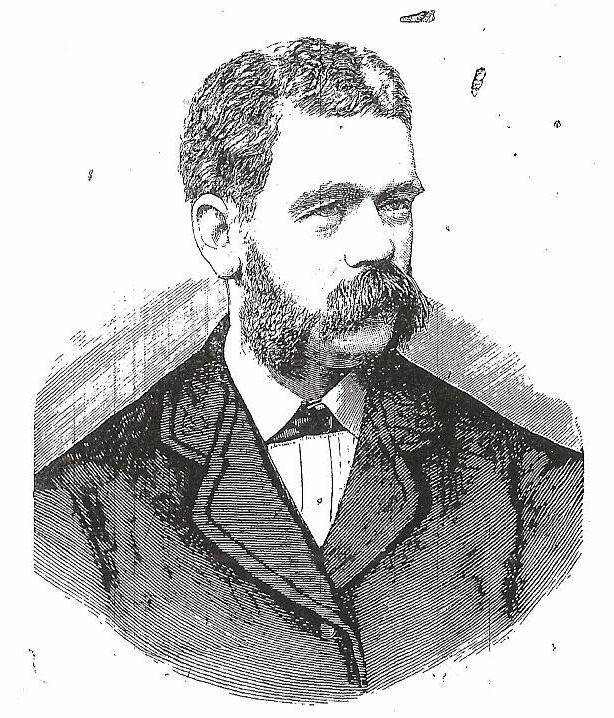 Wollaston, resided at Castle Hill House and was appointed Town Clerk in 1884. On taking up the office, he increasingly worked from home eventually building an annex from where he ran the town council and Dover! A great administrator, Wollaston Knocker guided the council through the maze of increasing legislation during which time the harbour changed from a provincial seaport to a major Admiralty port. In his final years, Dover was one of the most affluent towns in the country with a thriving port, military establishment and attracting wealthy visitors. Edward Knocker had been an antiquarian rising to become the chairman of that Society and Wollaston was of a like mind. He did everything he could to preserve Dover’s history. When the Round Tower in the Pier District, was discovered in 1880, he ensured that the ruin was documented and what he managed to rescue before it was destroyed ended up in his garden. The Round Tower had been a prominent part of the Tudor harbour and is the subject of a window in the Maison Dieu, depicting Henry VIII’s (1508-1547) departure from Dover on the diplomatic mission to the Field of the Cloth of Gold on 31 May 1520. In April 1893 the town paid £235 6s 3d to build a ‘thick’ wall around Castle Hill House. The following year Wollaston rescued a stone bearing the inscription H.I.M, dated 1666, found during a demolition. This was believed to come from St Helen’s Gate section of the town walls (now disputed) and he had it built into the recently erected wall. Sadly, when the wall was to be demolished some years ago, local historian, Budge Adams (1909-2000) tried to rescue it but unfortunately the demolition men ‘lost’ it. So revered was Wollaston, in the town, that as he lay dying in Castle Hill House church bells were silenced, traffic slowed down and people spoke in hushed tones when they passed the house. He died on Sunday 22 September 1907 at 02.00hrs and immediately all the flags in the town were lowered to half-mast. A day of public mourning was held on the day of his funeral. He was buried in the family vault at Cowgate Cemetery. On 9 October that year, it was agreed to hang the portrait of Wollaston in the council chamber and to appoint his eldest son, Reginald Edward Knocker (1871-1956), to fill his father’s position. The job of the Town Clerk was then divided, creating the post of Borough Accountant. Reginald was Town Clerk until 1935. In 1913 he moved his home and practice to 69 Castle Street at which time Kent Coal Concessions moved into Castle Hill House. Arthur Burr had formed this company in 1896 with the purpose of buying potential underground coalfields but not the surface land. He planned to sell or, ideally, lease these acquisitions for the royalties. By 1906 the company had secured coal mining rights over 20,000 acres of East Kent sufficient, it was said, for 20 collieries. Burr had holdings in a number of associated companies including the East Kent Colliery Company that owned Snowdown Colliery. Here, the first commercial East Kent coal was raised on 19 November 1912. A previous similar floatation had not been a commercial success and the Company Board were not happy. The situation came to a head at a meeting on 31 July 1913, when Burr along with his son, Dr Malcolm Burr, were ‘retired’ and the remaining directors consolidated Kent Coal Concessions. In May 1914, Burr attempted to raise £77,000 in debentures and £800,000 in income bonds for his East Kent Colliery Company. Little interest was shown and the holdings were handed over to Kent Coal Concessions by the Official Receiver, with the remit to consolidate. In December 1917, Burr was declared bankrupt with debts amounting to £53,176. He died in September 1919, aged 70. 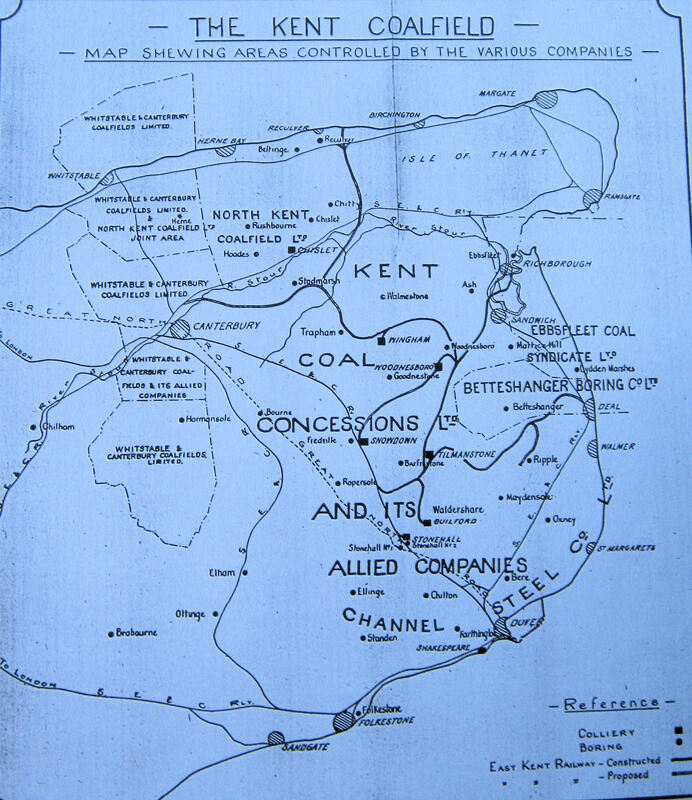 During World War I (1914-1918), many of the different East Kent coal mining interests were transferred, with the Treasury’s approval, to the Channel Steel Company. In 1922, that company took over rights held by Kent Coal Concessions who still retained some mineral rights. However, the country was in an economic depression with imported coal cheaper then home produced and nobody was interested in leasing these. In 1925, the directors applied to reduce the capital with a view to paying off Company debts and possible liquidatation. High Court judgement found in favour and although the decision went to Appeal the following year, it was upheld and Kent Coal Concessions vacated Castle Hill House. The Dover Labour and Trade Union club bought the House early in 1928 and refurbished it throughout. 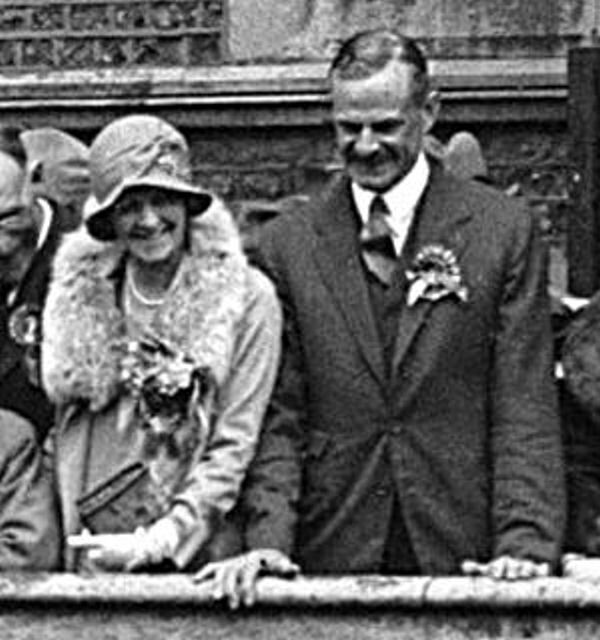 Jack Hayes (1887-1941) officially opened it on the 28 July as their headquarters. He was the first Labour Member of Parliament in Liverpool where he represented the Edgehill Division. The club stayed until June 1933 when the deeper economic depression forced the Party to sell the building. The advert stated that the House was a commodious property with 29 rooms. Rowland and Rowland, wholesale grocers, bought Castle Hill House and in the gardens built new offices and warehouses facing Maison Dieu Road. These came into operation in October 1934 and about the same time the company rented out Castle Hill House. It became a night-club with ‘hotel’ rooms and was known as Rennie’s Club. In February 1935, the Club was subject to a police raid when it was found that sixteen people, including a 15 year-old girl, were on the premises and five of the guests were consuming intoxicating liquor outside of permitted hours. The Secretary was fined a total of £50 with £10 costs and two others £5 each. The Club closed and the House was put on the market. It was bought by Dover’s Member of Parliament (1922-1945), Major, the Hon. John Jacob Astor, as his constituency home. He had previously had a flat in the Carlton Club, Market Square. This, in 1928, had become the headquarters of the local Conservative Party – his own political Party. It is said that both Neville Chamberlain (1869-1940) British Prime Minister (1937-1940) and Winston Churchill (1874-1965) British Prime Minister 1940-1945), stayed at Castle Hill House during these troublesome times. 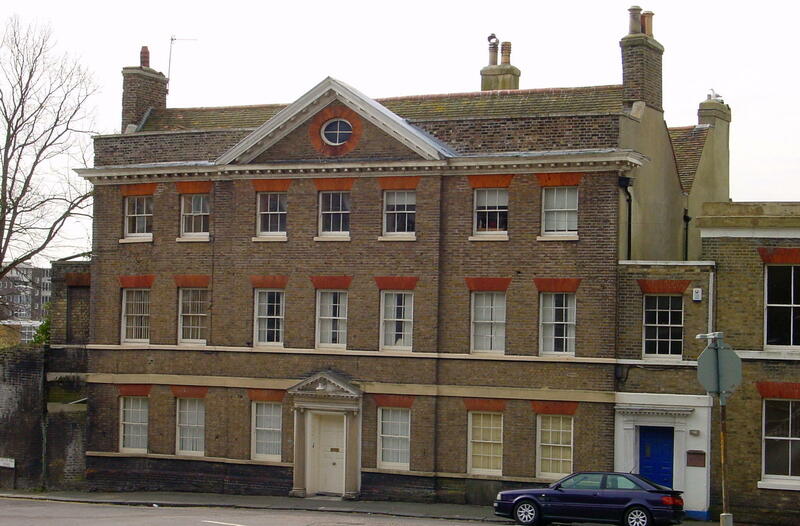 The ‘office’ annex of Castle Hill House was let to Kent County Council and the Premier Dance School, whose principal was local character Freddie Overton. During World War II (1939-1945), the House was used as a welfare centre for troops and although the surrounding area suffered severe war damage, it survived relatively unscathed. However, shelling in 1942 destroyed the Conservative headquarters (Carlton Club) in Market Square. Following the War, the council purchased the Carlton Club for £3,383. Major Astor decided not to stand in the post-war election of 5 July 1945 and on 10 May 1946, let Castle Hill House to the local Conservative Party and on 30 June 1949 the building was given a Grade II listing. Created Baron Astor of Hever in 1956, Lord Astor died in 1971 bequeathing the House to the Party. On 8 December 1994, the building was put up for sale when it was noted that both Winston Churchill and Margaret Thatcher had visited the House. The Grade II Listed building was bought by Robert Adams, of the old established firm Adams Printers of Dour Street and son of the local historian, Budge Adams. Robert Adams undertook considerable renovation before putting the house on the market. A film director and his wife, who is an executive with Fox Films, then bought the house. They planned to carry on with renovations that would have resulted in an upgrade of the Listing. Unfortunately, during the time the house was on the market a car-wash had opened, without planning permission, adjacent to the Listed building such that the wash was causing structural damage. Dover District Council Conservation Officer was called in to investigate and when the car-wash company finally applied for planning permission, the three-page conservation officer’s report strongly advised the Planning committee not to give permission to the industrial car-wash. The rebel Tory Dover Councillors, with one eye on the 2015 General Election and the threat of the United Kingdom Independent Party (UKIP), whose candidate in the Dover constituency waxed lyrically in social media on behalf of the industrial car-wash company, gave permission. 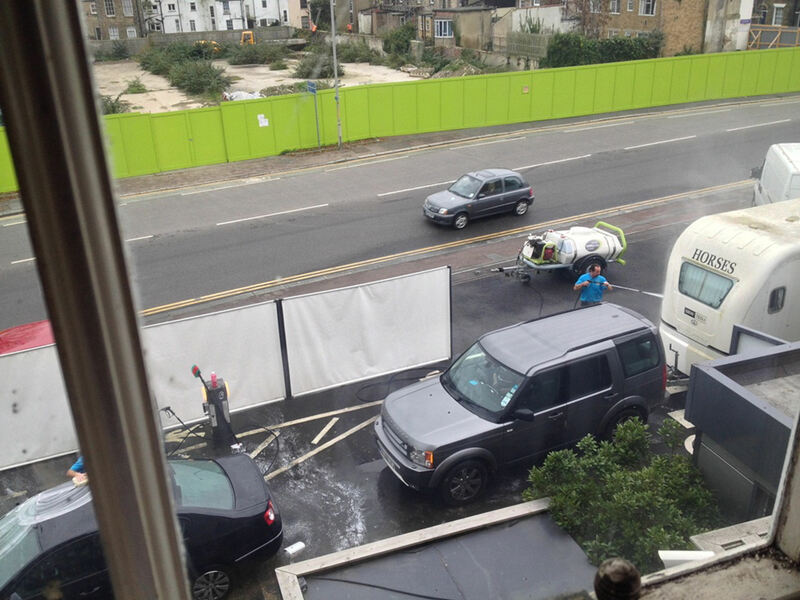 One of the rebel councillors, James Back, contacted Lorraine – the editor of this web site – saying that there had been a car wash on the site for some 45-years. Even the manager of the industrial car-wash publicly admitted that it had only been up and running for 18-months when he sort Change of Use retrospective permission. Her response was – pull the other one Cllr. Back!!! Incidental to this, the present owners bought Castle Hill House through Terson’s Estate Agents in Castle Street. The owner is a close friend of the former UKIP candidate, as can be seen in the article uploaded with the Transparency story. Lorraine wrote the historic background that was used with the Terson’s Castle Hill House sales spiel at the request of the previous manager. The events leading to the uploaded article and Lorraine’s subsequent blacklisting, happened at the time the sale was going through. On the right is a photograph taken from the lounge window of Grade 2* listed Castle Hill House on Sunday 1 November 2014, of the facility that Councillors at Dover District Council approved. This was with the backing of the Mayor of Dover and a Politician running on the forth-coming General Election. The local media, except one that was pro the car wash, had been notably quiet. Grade2* listed means that the building is of significant national importance and must be preserved etc. Castle Hill House was Grade II listed on June 30th 1949. This listing was upgraded to Grade II* on September 22nd 2014. This entry was posted in Buildings, Castle Hill House, Castle Hill House, Castle Hill House, Castle Hill House and the Car Wash, Kent Coal Field, Local Government, Wanton Destruction. Bookmark the permalink.